SPARCengine systems are among the less well-known SPARC systems out there. They strike as an oddity in Sun's hardware catalog - neither a workstation nor a server, these boards were intended to be used for specific automation tasks, as were its 68020-based predecessors, the Sun 3/E. Rumour has it that the SPARCengine boards were built to fulfill an important order from Eastman Kodak. After that, Sun left the embedded market, which allowed the usual players in that area, such as FORCE, to design and sell their own SPARC-based systems. Sun Microsystems Inc has signed a technology transfer agreement with real-time specialist Force Computers Inc, under which the Campbell, California-based company will second source Sun's Sparcengine 1E processor board. The 1E is a VMEbus version of the Sparcstation 1 motherboard, and will be available from Force, with integrated SunOS and real-time capabilities, from March. Sun hopes the deal will increase its presence in the real-time VME applications market. Sun's long-term intention is to phase out VME board production, handing it over to Force, from which it will then buy-in boards to resell. Another real-time software vendor, Wind River Systems, is set to announce the availability of its VxWorks real-time Unix kernel on the Sparcstation 1 VME board, while other real-time players Microware Systems Corp and Uniflex also plan to deliver Sparc implementations later in the year. workstation. 8K MMU pages rather than 4K. boards available. Code name "Polaris". A 20MHz SPARC CPU (here, a Fujitsu MB86901A) with 64KB of write-through cache. An optional FPU (here, a Weitek WTL3170A). 4 megabytes of memory (some boards were fitted with 16). Two Zilog Z85C30 dual serial ports, one for the two serial ports on the right side of the faceplate, one for the serial keyboard and mouse, using the type-3 style connector (second connector from the left on the faceplate). A (canonical) AMD AM7990 LANCE Ethernet (third connector from the left on the faceplate). An (also canonical) Emulex/LSI Logic ESP100A SCSI controller (leftmost connector on the faceplate). A single, master capable, SBus slot. Still, there was not enough room to fit the boot PROM! It stands on a small, low-profile daughterboard. The other side of the board is quite populated as well. Note the metal bar in the middle, to improve the rigidity of the board. Here is a slightly more recent revision of the SPARCengine board. The main difference with the previous board is that the CPU is an LSI Logic L64801 (which is an equivalent SPARC v7 implementation to the Fujitsu MB86901 found in the other board). While there, have a look at the serial port connectors. These are a unique VGA-style 15-pin connector on three rows, and require tailor-made serial cables. Sun Microsystems also built an expansion board, 501-8060. 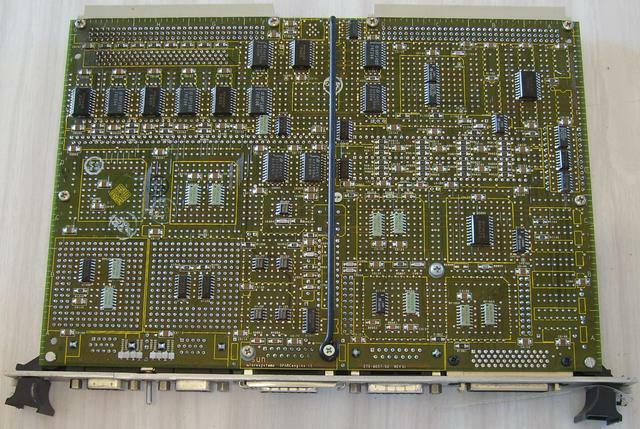 It is another 6U VME board, which gets connected to the SPARCengine board via the P2 connector (VSB-style), and sports 16 SIMM connectors as well as two SBus slots (slot #2 not being master-capable, in typical early SBus style). The memory connectors are divided into four banks of four SIMMs and accept either 1MB or 4MB SIMMs. 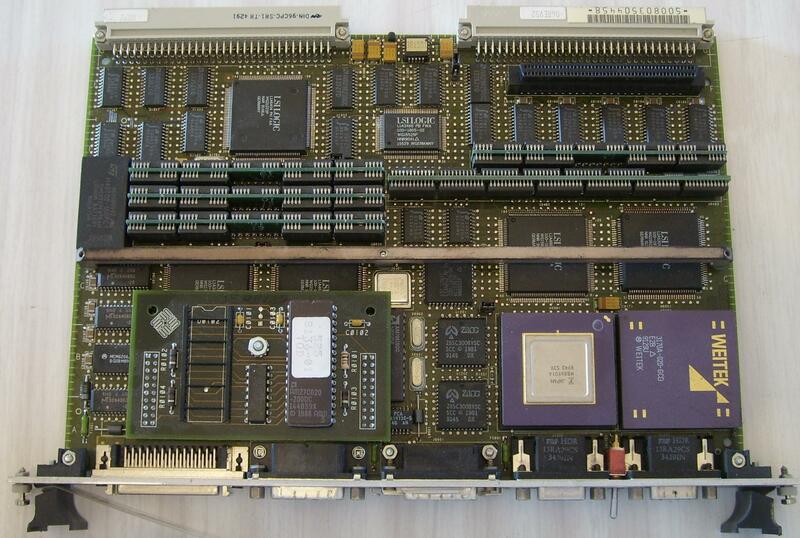 A fully populated board can thus expand the SPARCengine memory from 4 or 16MB to a whopping 68 or 80MB. Sun Microsystems Inc has expanded its Sparcengine 1E Eurocard family of boards with five new hardware and software products. The 4E60-SRX SBus/RAM Expansion Board enables developers to add a second SBus connector to a Sparcengine 1E and has sockets for memory expansion; and the 4E60-16 Board uses 4M-bit memory chips to offer 16Mb. The 4E60-SRX SBus/RAM board costs $900 with no memory fitted; the 16Mb 4E60-16 costs $12,000 including a two-user SunOS right-to-use licence, and both are available now. Operating system choice on the SPARCengine 1E is quite limited. Besides SunOS 4.1, and maybe some early (< 2.5) Solaris versions, I am only aware of VxWorks being ported to the SPARCengine 1E (as mentioned earlier). It was time to broaden this choice by adding a free software OS to the list! In fact, years ago, Jason Wright (jason@) had attempted to port OpenBSD to this board. But his board being only fitted with 4MB turned that idea into an exercize in futility. It did not take long to convince him to ship his board to me (this is the first board pictured in this document). ROM Rev. 1.6, 4 MB memory installed, Serial #12648430. Ethernet address 8:0:20:f:9:35, Host ID: 61c0ffee. Being a VME board, it shares the 8KB page size of the existing VME Sun systems (sun3 and sun4). And being a more recent design, it shares the FORTH OpenPROM of the desktop SPARC workstations (i.e. SPARCstation 1, and the rest of the sun4c family). To be honest, I had tinkered with this board in 2003, but could not get it to load anything over the network. It turns out this was caused by a stupid PROM bug which makes it fail to TFTP load code which size is an exact multiple of 512 bytes. After deliberately appending a few bytes to my code to make it unpadded, the PROM was sure more than happy to run it. It did not take much for my code to die horribly. Systems using OpenPROM rely upon the compatible root node property to figure out which kind of system they are running on. The page size is 2000 hexadecimal, i.e. 8KB. And we can check whether pagesize is 4KB (sun4c) or 8KB (sun4e). With that knowledge, it is now possible to run a working boot loader, and hope to run a kernel. At this time, I did not have an extra memory board, so I had to build a stripped-down kernel in order to be able to fit in 4MB... and giving userland some memory to use. I eventually succeeded getting a kernel to load, although there were not enough pages left for userland to run without swapping like mad, and thus suffering a severe performance hit. Yet I have been able to run single user, albeit slowly. Verrrrrrrry slowly. Eventually I got my hands on a memory and SBus expansion board, half-populated with eight 4MB SIMMs. No need to run stripped kernels anymore! ROM Rev. 1.6, 36 MB memory installed, Serial #12648430.
starting RPC daemons: portmap ypbind. Note the odd vm child of the sbus node. Now, all I need to do is connect an SCSI disk again and enable autoboot.